The above photo shows Frank Moore on the right and a friend, possibly Lew Harris, riding their bicycles on Main Street in Calais just beyond the Border City Hotel.The Border City was torn down in 1939 and replaced by the JD Thomas gas station. 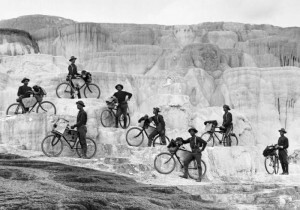 It is a wonderful old photo, taken in the 1880’s when the “safety” bike, the type we know, was still 10 years in the future. 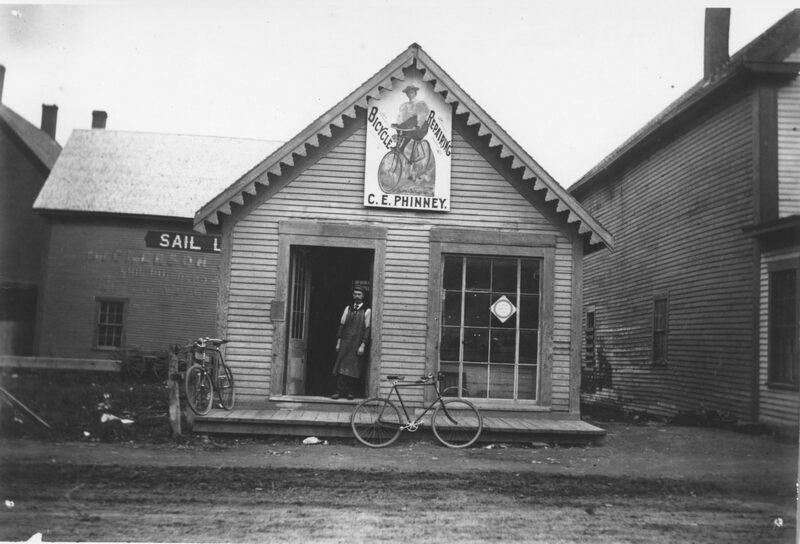 Frank’s bike was far from safe but the bicycle was gaining popularity here in the St. Croix Valley and Frank was one of the first to own one. Frank Moore was the grandson of Job and Vesta Holmes and brother of Josephine Cony Moore who gave the Historical Society the Holmes Cottage and established the trust in her will for the Holmestead, now also a Society building. Frank was born on July 12, 1866 at the Holmestead to Agnes Holmes Moore and Edward Moore and was named after his uncle Frank P. Holmes who had died three years earlier at the battle of Fredericksburg, a loss from which Job and especially Vesta Holmes never entirely recovered. Frank Moore grew up in the Holmestead and lived there a good part of his adult life. He attended dental school and practiced in Calais until his death in the 1920’s. The history of the bicycle is interesting but too lengthy for this article. In brief summary the first bicycle was introduced in about 1865 and was called the “Boneshaker” or “velocipede” (fast foot). It looked much like the bike of today but was made of wood with iron tires and could only be ridden comfortably indoors at special “riding academies”. 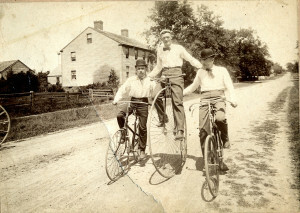 In the 1870’s the “High Wheeled” bike was developed. The fellow on the left in the photo above is riding one of these. Power was applied directly to the large front wheel and there was no freewheeling mechanism. Serious injuries were common. If the front wheel struck nearly any object, even a stone, the rider would “take a header”, hence the term. Broken wrists were endemic in the riding community. In the 1880’s the “safety” high wheeler was developed with the small wheel in the front and in 1882, when he was just 15, Frank Moore bought one, perhaps the one in the above photo. Frank had long wanted a bicycle as can be seen from his diary entries for 1882. March 3, 1882: Went to school. Took 3 examinations. Snow most all gone. Got a letter from Heber. Sent for bicycle circulars. March 4, 1882: Went to school. Went up to Cotton Mill. Big freshet. Man drowned. Dam gone. Machine shop going. Great excitement. Sent for bicycle circular. Windy. March 20, 1882:Went to school. Got a circular of bicycles from N.Y.
April 7, 1882: Bought stiff hat; Studied Easter piece. Got bicycle circular. April 29, 1882: Went to school. Father settled with me and gave me $40, 20 of which I earned, $5 he gave me and the rest he lent me. I took it over to Uncle Harry for him to get me a bicycle when he goes away and he said he would put $5. to it. I got paid off in gold double eagles. May 3, 1882: Went to school. Rode Lew Harris’ bicycle. Sawed wood. May 9, 1882: Uncle Harry got home tonight. He got me a 116 in. machine. Price $50. Cost $35. Won’t be here til last of week. May 11, 1882: Staid in bed till noon. Bicycle came last night at 10 O’clock. Got it this noon. Lew Harris tried it out and says it is a good one. Tried it myself some too. May 12, 1882: School. Got up at 6 o’clock and learned to ride bicycle. Rode considerable with Lew and feel quite sore. Went over the river. Polished it all up after supper. 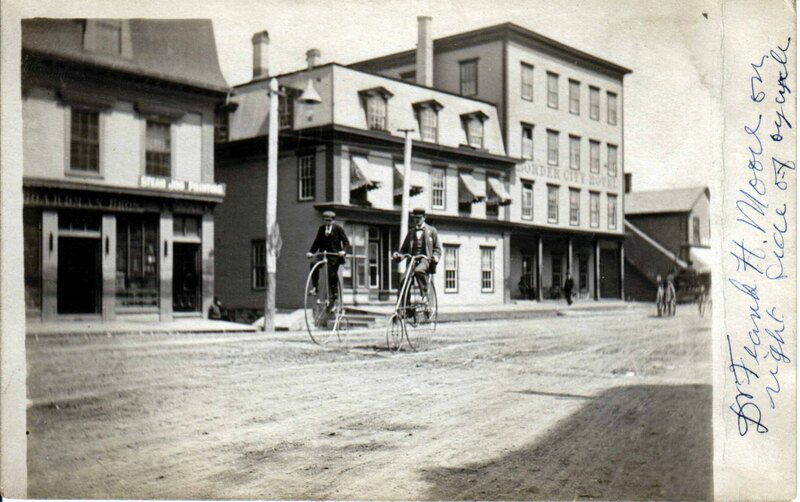 May 13, 1882: Lew and I rode all round on bicycles. Went to Porter’s Mill Stream and the Park. Rode some after supper. Like it. May 17, 1882: School. Worked a while in shed and then rode bicycle. Broke off a bolt in the hole and it took an hour to fix it. Rode all the rest of the afternoon and went up the hills between here and the bridge. Got a letter from Ed and Min Moors. Judge Libby and Mrs Pulsifer went away today. Judge gave me a dollar. Got a letter from Aunt Annie last night and also a circular from A.G. Spaulding and Bros, Chicago. Got some bad headers on the bicycle today. May 19, 1882: Did some errands on the bicycle. Lew broke backbone of his when we were uptown riding in the evening. June 12, 1882: Monday: Sprained ankle again getting on bicycle. Didn’t go to school in the afternoon. Lew has got his bike fixed. HAW! July 17, 1882: Monday: Went to St Andrews. Took bicycle. Created quite a sensation. Oldest inhabitant aroused. Thrilling encounter with county sheriff. Enjoyed myself immensely. Frank and his friend soon became avid bikers and like thousands across the country began to form clubs but injuries were quite common. Medical authorities in England warned anyone over 40 to stay off the contraptions while admitting they did provide beneficial exercise for those supple enough to withstand falling off. Within a decade the dangerous velocipede was being replaced with the bike we know today although many early bikers, like the one above, were reluctant to switch. His friends had more sense. Bike races became very popular throughout the country and were an event in Fourth of July celebrations in Calais as early as 1882, the year Frank bought his bike. 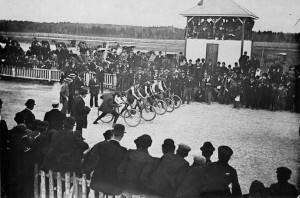 The photo above shows the start of a race at the St Stephen Fairgrounds in 1899. The riders were allowed to have their strongest friend give them a push at the beginning of the race. Bicycles, which were commonly referred to as “wheels” were expensive, the cost amounting to about 6 months pay for the average workman and Frank Moore was able to buy one only because his family was relatively affluent. 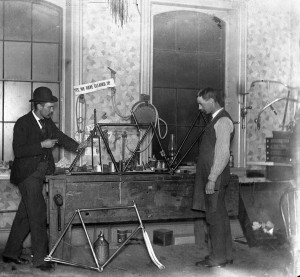 In the late 1800’s bike shops such as Charlie Phinney’s shop above flourished. Charlie worked in a carriage factory in St Stephen until about 1900 when he opened the first bicycle shop in Calais, now the location of Roger’s Auto Body. Within 10 years he built a large garage and began selling cars including the first two in Calais. He claimed to have installed the first gas pump in Calais in 1911 but other evidence is strong that Sunny Jim Alexander had the first pump in 1909 at the corner of Union and Main Streets. Nonetheless Charlie Phinney was a local pioneer in the transportation revolution which was sweeping the world and putting the horse out to pasture for a well deserved rest. By 1900 the bicycle had become a popular means of transportation, cheaper and with a lot less upkeep than a horse. The military formed bicycle corps like the 25th Bike Infantry shown above in Yellowstone in 1896. 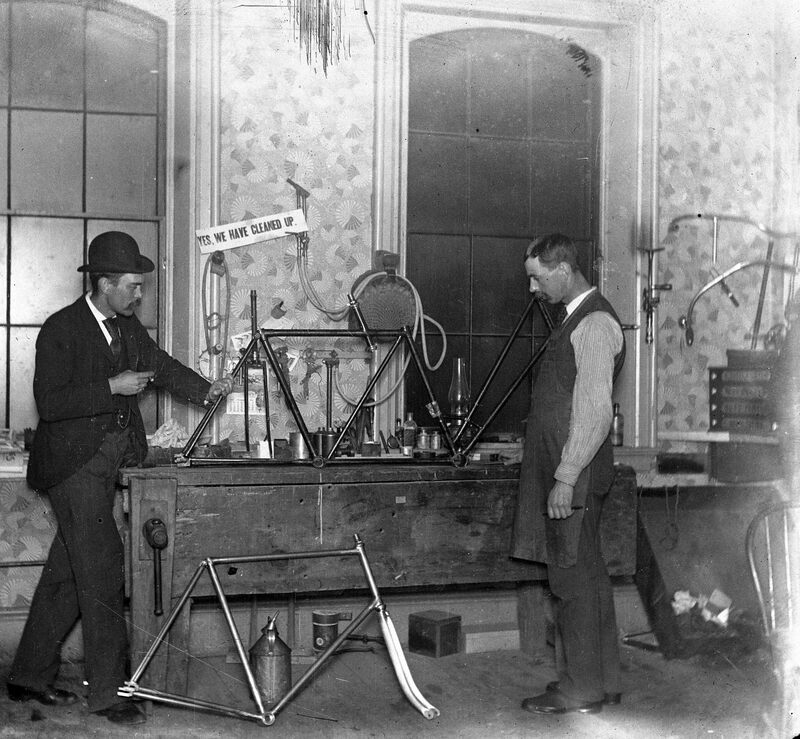 Because bikes were still relatively expensive many bike shops like Charlie Phinney’s rented to the general public and failure to return the bikes became common. 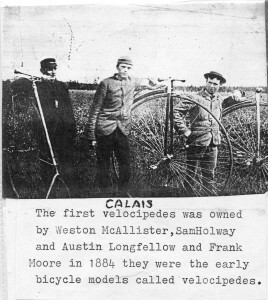 The first bike local theft is reported in the Calais Advertiser of November 11, 1894. We should point out that escape from the Calais lockup in those days was easily as common as falling off your bike. Newspaper articles of the period are replete with reports of escapes and it seems the authorities were more than willing to look the other way when “Kanucks” like Alex Badour saved the City the cost of incarceration by fleeing the jurisdiction.